Borow are a Russian act that was formed in 2007. Throughout the years, they recorded several pieces of gore and death, amongst which two self-released full lengths (in respectively 2008 and 2009). 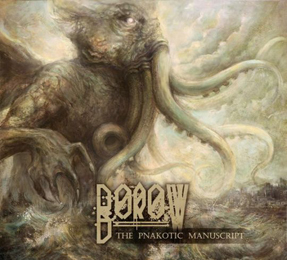 And in 2013 they worked on the third full length, which is called The Pnakotic Manuscript. It was recorded at Blast Wave Records with next line-up: Alexsey Martynov (v, g), Nikita Valdaev (d), Vasiliy Kudryavcev (g), and Alexsey Samartcev (b) [Nikita and Alexsey S., for your information, are also involved with One More Victim]. The Pnakotic Manuscript has duration of thirty eight minutes and bring a very firm, intense form of technical, slightly grinding Death Metal. It’s clear as from the very first seconds of the album that Borow deserve to be a respected band. Opener The Crouching Chaos immediately shows this band’s strength: the capability to create convincing power with splendid melodies and technical craftsmanship. And what’s more, these Russian guys do not need full-blasting speed to convince. Besides, they do add some truly lovely details, like crafted trem leads, atmospheric keyboard lines (also via intros and outros), a timeless approach (modern meets old schooled), an influence going back to the worldwide scene (not limited to the Swedish, Polish, American or, for my concern, the Samoan scene only, yet taking elements from all over Mater Terra without forgetting to pay respect), unexpected yet not infantile-exaggerated hooks and tempo-changes, and so on. On top of it, The Pnakotic Manuscript comes with a fabulous sound quality, intelligent lyrics, an oppressive and obscure atmosphere, and really marvellous artwork. Bands that might come to mind are Nile, Hour Of Penance, Fleshgod Apocalypse, The Black Dahlia Murder, Behemoth, Shaarimoth, Centurion, The Monolith Deathcult, Soilwork, God Dethroned, Abysmal Dawn, … Bon, I think you got the picture… But believe me if I say that the final result is at least as overwhelming and interesting as any of those comparisons!